Every May, we recognize National Stroke Month. It’s a time for us to raise awareness about the impact of stroke not just on the individual, but on the family. This month, two people are going to share their stroke story from two very different perspectives: survivor and partner. Each week this month, we’ll hear from Steve, a stroke survivor, and his partner Tracy. They’ll recount their experiences at different stages of the recovery process, and provide a perspective that only someone who has been there before can. 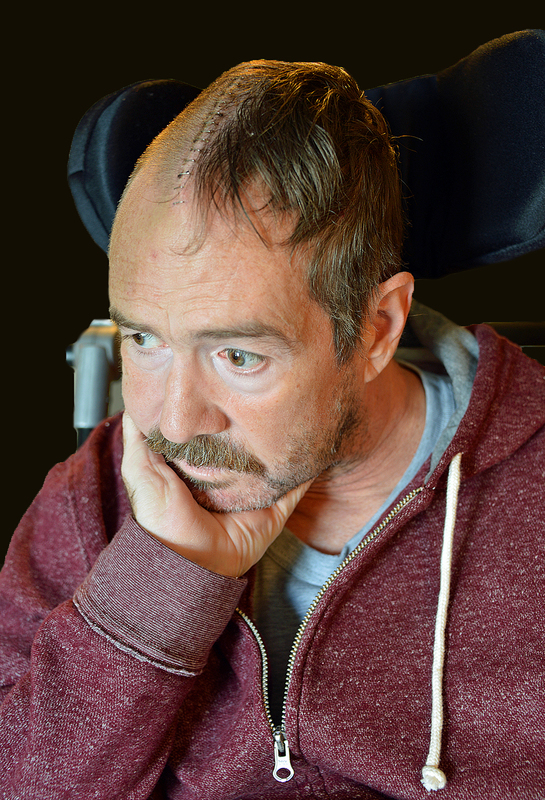 Last week, Tracy shared what happened the first few days after Steve’s stroke. Today, she talks about his transition to rehab – and how she got through it. After Steve finished his first day of inpatient therapy at Magee, I stopped by for a visit. As Steve said in his post, the most difficult part in the beginning was his feeling of losing his independence – for me, it was seeing him not only in pain, but how unhappy he was. It was all very difficult to take in. Here was Steve, confined to a hospital bed and wearing a helmet. He was on a “dysphagia diet” because of his difficulties chewing and swallowing. All that was upsetting, but I could handle it. What really got to me was the Hoyer lift. Seeing him transferred from bed to wheelchair (or vise-versa) using some overhead mechanically sling was devastating for me. Steve – who is proud of his proven survival skills — was completely dependent on others for all of his basic needs. And he knew it… and he had to succumb. He said to me, “Tracy… do I look like some sort of monster?” My heart broke then and there. While there was a lot of confusion, one thing was for sure: Steve had a long road ahead of him, and so did his family. Within the next couple of days, Karissa and I began to meet his doctors, nurses and therapists, along with his caseworker who kept me updated on Steve’s recovery and treatment plans. It was overwhelming. We had many questions. I mean, wouldn’t you? And Magee thoroughly answered all. Then came the BIG question: “Will Steve recover completely?” They explained to me that he would have goals set forth for him and that it would be “one step at a time.” A bag was attached to the back of Steve’s wheelchair. In the bag was a binder that contained his goals and notes from his therapist. This was for Steve to share with his family. Throughout his time at Magee, this would prove to be a great tool for us, giving us insight to his recovery and providing us with some special requests that arose. Not two days since he arrived, Steve’s doctors tell me he is doing great – he’s working hard in therapy and making progress. They estimate his stay will be between 6 and 8 weeks. That’s a long time – but we all try to keep Steve positive. Karissa and I decorate his room with many of our photographs, including some striking ones Steve did himself. The room takes on a bright and cheery look to it. I think this is good for Steve’s emotional well-being – and the staff love it, too! They start to ask Steve about his photography, which he loves. But it’s not just the room. I want to make sure my presence is uplifting and positive as well. Every time I visit, I dress in pretty, colorful clothes. I wear make-up and jewelry. When he is around, I am always upbeat. Amply portraying a positive attitude. While offering a nurturing touch. That’s what he needs. But when I get home… well, that’s when I can cry a little bit, and sometimes a lot. My twin teenage daughters tell me they are very sorry for my pain. I apologize to them for having to see me like this. Rocky and Ruby my loving and ever so loyal dogs come to my side and I hug them and tell them all will be okay. I turn to my friends each and every day. I eat dark chocolate. Drink fresh coffee. I laugh. But most importantly, I believe. I believe the love and encouragement from my family and friends will keep me going. I believe in Magee’s promise of finding a way back. But most of all, I believe in Steve. Check in next week to hear more of Tracy and Steve’s journey. Visit Patient Stories to see all their posts.